Still gas left in HSPA tank. Telstra will conduct a six-month test of Long Term Evolution (LTE) technology starting in May but was clear it would wring more out of HSPA+ before considering a commercial LTE rollout. The tests, to take place in Victoria, will use LTE kit from Ericsson, Nokia-Siemens Networks and Huawei and run in ACMA-approved 2.6 GHz test spectrum and 1.8 GHz spectrum. Telstra wireless executive director Mike Wright said Telstra would use the trials to gain "foundation knowledge" on LTE operation in metropolitan and rural areas. "The intention is to understand this new technology," Wright said. Wright said the telco would seek to understand things like the differences in spectral efficiency possible when using orthogonal frequency division multiplexing compared to wideband-CDMA used on 3G networks. 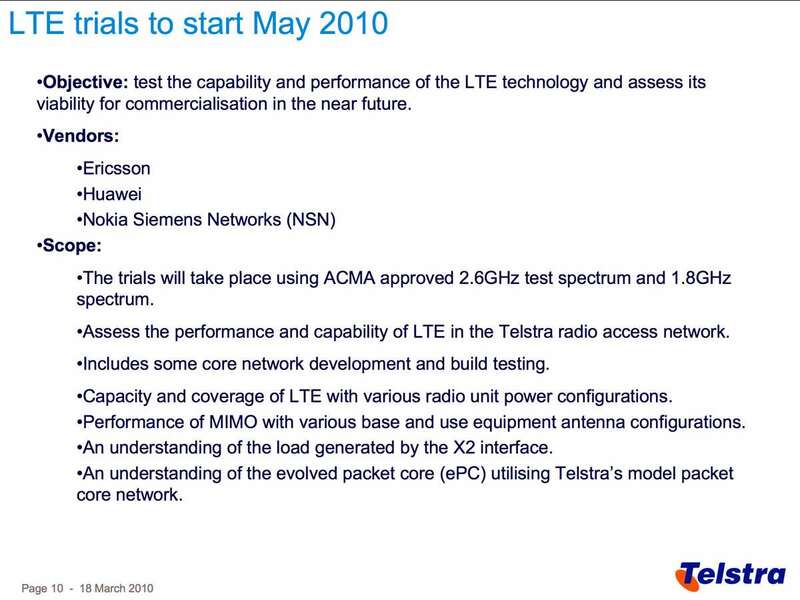 The LTE tests would also involve "some core network development and build testing", according to a slide in a presentation to media and analysts today. "[In LTE] the [network architecture] smarts are pushed out to the base station. That's going to put pressure on base stations to signal to each other and manage traffic," Wright said. While Telstra was keen for the knowledge the tests would provide, it was cautious about when LTE services would be commercially available. "If you want to be a leader in technology sometimes you have to take bold moves but they are well-calculated," acting chief operations officer Michael Rocca said. "Let me make it clear - we're not just going to jump onto LTE. That makes no business sense." Wright was similarly inclined: "We're seeing LTE as a means of continuing the performance characteristics of the network we've already built [Next G]," he said. "It's really about squeezing more out of our network investment in a way that also gives us greater capacity and lowers our unit cost." Huawei said it would supply Telstra "with the necessary base station equipment, core network equipment and LTE terminals" in the trial. "More than 20 Huawei staff will work with Telstra to complete the trial," a spokesman said. Other vendors Ericsson and NSN told iTnews they would also commit significant resources and equipment to the trial. Rival Optus said late last year it would trial LTE in the first half of this year as part of a coordinated regional test by its parent SingTel. Its tests would take place "over a period of six to nine months" and would involve kit from Alcatel-Lucent, Ericsson, Huawei, NEC, Nokia-Siemens Networks and ZTE. Telstra is also testing ZTE albeit via its Hong Kong subsidiary company CSL where, it said, "ZTE equipment is being put through its paces." "The collective information gathered through these trials will be used to guide planning and design of Telstra's future Next G network evolution," the carrier said in a statement. Commercial deployments of LTE aren't expected until at least 2013 or 2014, according to analysts. In particular, Ovum analyst Nathan Burley believed that there was no advantage to being first to deploy the technology. 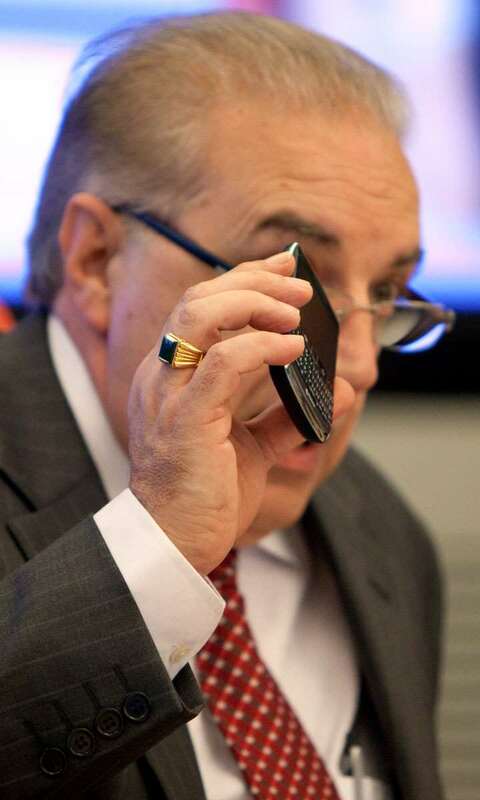 "Like 3G, we see little advantage in being the first mover with LTE," he said. "Although not its first 3G strategy Telstra Next G strategy demonstrates this. It deployed a mature 3G standard over 3 years after it was first offered by Hutchison in Australia. "It is reasonable to expect LTE to mature slightly faster than 3G, however its deployment in Australia should correspond broadly to what we saw with 3G UMTS, except around seven years later. "This means around 2014 is likely to correspond to the 3G experience of 2006/2007 when the technology started rapid adopted in the mass-market." Burley believed that, at least initially, LTE will "largely be an overlay in high traffic areas to allow carriers to deliver more capacity to more users." Rocca said Telstra's main challenge was to make the user experience of the transition between HSPA and LTE as seamless as possible. LTE would enable Telstra to extract more efficiency out of its mobile spectrum, Rocca said, but he - and Telstra - felt there was still "a lot of gas left in HSPA+" before LTE was necessary. "We want to continue to exploit gas in the HSPA tank," Wright added. "Next year we'll move to a combination of dual-carrier and multiple-input multiple-output (MIMO) technology." That offered peak speeds of 84 Mbps. Tests would be conducted later this year to determine actual user speeds although Wright believed they would be around "a third of claimed peak speeds" as a rough estimate. Telstra made a software upgrade to Next G late last year to enable dual-carrier technology, which enabled it to increase data rates on the network. Closed network tests showed downlink speeds of 36 Mbps bursting as high as 40 Mbps. "Around the middle of this year we'll bring a dual-channel HSPA device to market," Wright said. Telstra's current Elite modem boasts downlink speeds between 550 Kbps and 8 Mbps.